We Print It All & We Print It Right! Bob’s Busy Bee Printing is proud to be Tampa Bay businesses and companies trusted printer for over 30 years. We’re a full-service printing company, providing a vast variety of color printing products customized to your specifications. We print it all – from single digital copies to four-color brochures, business cards, and direct mail postcards. And we print it right –professionally, quickly, and most importantly, the way you want it. At Bob’s Busy Bee Printing, we provide more than just a printed product – we provide a printing service. Our enthusiastic team of printer professionals provides personalized service to build lasting business relationships, one print job at a time. With 24 hour online access to our website, you are able to place orders whenever it is convenient for you. You can also visit our business Monday through Friday, 8:30AM to 5PM. What Can Our Printers Print for You? If you can imagine it, we can print it. As your trusted Tampa printer, we can handle any kind of printing you need. Whether you need letterhead, envelopes, pocket folders, business cards, or brochures, our team of expert designers and printer service professionals will work with you from start to finish, producing attention-grabbing graphics and sharp color promotions. If you are in need of a printer in the Tampa area, contact us today to see what we can do for you! 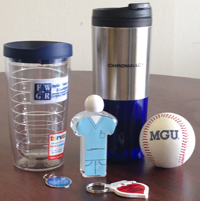 We offer a full line of Promotional Products. Click on the box above to browse our extensive online catalog or give us a call and see how we can increase your marketing presence.